LOCATED IN GERMANY, between the cities of Leipzig and Frankfurt, and oriented along the Fulda River, the Fulda Gap is a name given to a mobility corridor oriented on a line that runs from Leipzig toward Frankfurt. It is bounded on the south by the Vogelsberg Hills and on the north by high ground north of the autobahn (highway) that transects this area. Early in the beginning of the Cold War (1947–89) NORTH AMERICAN TREATY ORGANIZATION (NATO) war planners developed contingency plans for the defense of Western Europe in the event of a Soviet Union-led invasion. They considered the Soviet ground combat doctrine, the mechanized and motorized nature of modern forces, and the compartmentalized terrain of both West and East Germany (Federal Republic of Germany and the German Democratic Republic). Military planners considered the most likely avenue of approach for the main thrust of an invasion would be down a mobility corridor along a general line from Leipzig to Frankfurt and the RHINE RIVER. The hub of this corridor begins in the vicinity of the towns Erfurt and Eisenach and crosses the old border between East and West Germany in the Phillipstal-Rasdorf area. 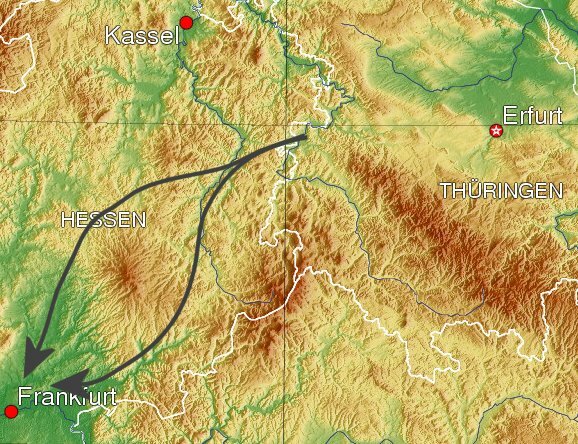 The route would cross the Fulda River and then run west to the gap between the Vogelsberg Hills and the high ground north of the autobahn. The broader corridor that begins at this gap and runs astride the autobahn all the way to Frankfurt and the Rhine was known by U.S. forces charged to defend this area as the Wetterau Corridor. The first defensible terrain on the western side of the inter-German border was the Fulda River, which would have to be crossed by any invading force. The mobility corridor remains somewhat restricted by the high grounds to the north and south. Once past this gap, the terrain opens up allowing for greater maneuvering, and would give an invading force more opportunity to invade Frankfurt and seize crossing points along the Rhine River. The European General Defense Plan called for U.S. forces to deploy along a general defense line that could interdict Soviet forces moving into West Germany along routes through geographic areas such as the Fulda Gap. These operations plans described in detail how the U.S. forces would respond to a Soviet-led attack across the inter-German border. The concept was to delay invading forces long enough for reinforcements to arrive from the UNITED STATES. The plans described the defensive positions and actions of each unit and even laid out the nightmare scenario of use of nuclear weapons by ground forces. The U.S. Army was most familiar with this invasion route, as General George S. Patton’s Third Army had come through the Fulda Gap in its drive from the crossing of the Rhine near Frankfurt to Leipzig in April 1945. Armies have passed in both directions along this corridor in many wars, including the Austro-Prussian War (1866), Napoleonic Wars (1806), Seven Years’ War (1756–63), and Thirty Years War (1618–48). It appears that even the marauding Mongols and the imperial Romans used this route for travel and conquest.